What is the origin of the shield shape? I've seen it used in a few other places (I seem to recall it being used by the USDA once), but often the dimensions are different. Does anyone know where the shield shape originated from, and if it has any significance to Mexico? (In the same vein of the US highways and interstates using the shields of the United States). Looks like a cross between a shield and an arrowhead to me. Does not all of Central America use these shields as well? Don't think so--I think Costa Rica and some other countries that use the Central American MUTCD (which is loosely based on the old Puerto Rican traffic manual) use the US highway shield, more or less. The US highway shield is loosely based on the shield used by the US Department of Agriculture, which is still seen on labels for packed meat that is required to be federally inspected, and I think this is because federal highway oversight was (if memory serves) under Agriculture before it was moved to Commerce. The Mexican state highway shield is a pretty standard escutcheon. I cannot find a precursor for the Mexican federal shield shape. It occurred to me that it might be based on an old badge for the Rurales (Porfirio Díaz's attempt at a national police force), but it seems they used either a round-top escutcheon or a round belt-and-buckle design with upraised hand in the middle holding a spike. The US highway shield is loosely based on the shield used by the US Department of Agriculture, which is still seen on labels for packed meat that is required to be federally inspected, and I think this is because federal highway oversight was (if memory serves) under Agriculture before it was moved to Commerce. Check this Mexican Highway Shield! I've never seen this in Mexico before in many many hours of looking at Mexican Roads on GSV. Imagery was taken in April 2015 so it is still there. There's another one another mile down the road too! Yes, I've driven by that very shield several times, and is the only example of a stand-alone reassurance marker I can recall seeing in Mexico. If there's another one, then I'm 99% sure it was also on Fed-40. FYI, all I can see in your second link is a kilometer-marker in the median. Kilometer-markers with numbers ending in -0 or -5 generally display a route marker like that. It's usually on a black background, which is not easily visible in your link. Don't think so--I think Costa Rica and some other countries that use the Central American MUTCD (which is loosely based on the old Puerto Rican traffic manual) use the US highway shield, more or less. Rounded top, pointed corners, wider in general. It's a horse of a different color. I saw a picture of a Mexico 1 stand alone shield in the 1983 edition of the ACSC Baja California Guide Book. 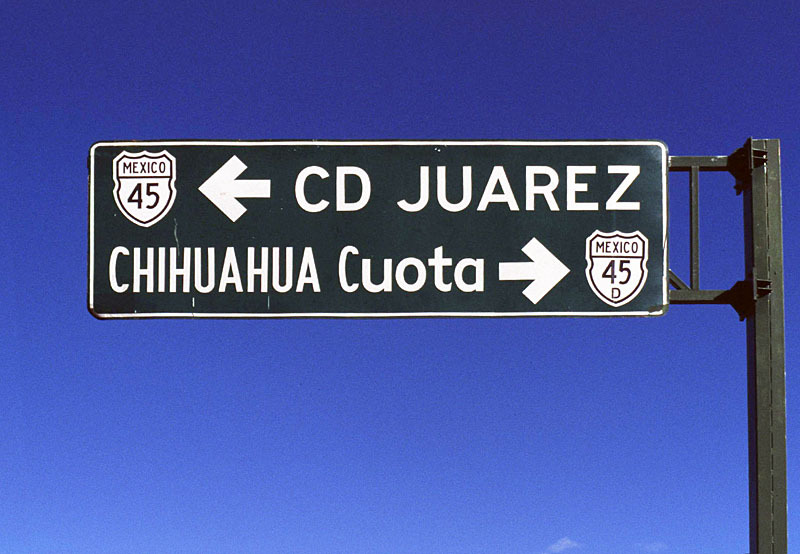 The sign had a U.S. style directional banner in Spanish. ("Norte" as I recall.) I believe that these used to be common in the old days but are now mostly gone. Also, when I was in Tijuana in 1983 the "BGS" signs on the short "freeway" section just south of the San Ysidro border crossing were in Series E Modified Highway Gothic and I specifically recall that for Mexico 1D the "control destination" was "Ensenada Toll Road" (in English) and for Mexico 1 was Rosarito. There was a third "BGS" destination but I do not specifically recall what it was though it was possibly for Mexico 2 and Tecate. Directional stand alone signs at the MX 49 and MX 41 intersection. They're rare, but there are still some out there. I found this one by accident just looking at MX 49 on GSV. Off topic, but based on what I've seen on GSV I would never take the cuota 49D, but that's just me.